I am betting that most folks don't know there is a ham radio station at the National Hurricane Center. That's true, unless you're an amateur radio operator. We're here since 1980. It began when (NHC Director) Dr. Neal Frank asked us to put up a station at NHC to talk to the Caribbean Islands because they'd lose communications. Was the intent to establish communications during a hurricane or to gain additional information? He wanted to be able to talk the islands when they lost their landlines and teletypes. When the islands were affected and local airport or Meteorology stations were closed down just before a hurricane, NHC would have no information coming back. So we filled in that link that would go down during hurricanes. We began with the Caribbean Islands, and then expanded to all of the Atlantic and Gulf and as far as the East Pacific. You must be very proud of this. My entire group is very proud. They are all volunteers; some have been with us for more than 30 years. Is it a basic requirement for a ham to be a bit of a weather fanatic? No, it's not. We have expanded from using only ham radio. When the Internet came on line, we established a website where you can fill in a weather report and send it directly to us at NHC. 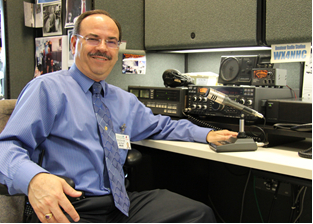 So, you don't have to be a ham radio operator to send in your surface or eyewitness reports. How did you become a ham? It was in high school. My then future father-in-law had a shortwave radio receiver. One day he was listening to some broadcast stations, and I started fooling around with the dials and happened to come across some people talking from the Midwest down to Florida. And I thought wow - these people are talking with each other on a radio! Then I found out there was a ham radio class at my high school, this is back in 1977. From that point on, I just got into all of the aspects of ham radio communications. I was hooked. What was the first hurricane experience for you? We had Hurricane David in 1979 brushing South Florida. I wasn't involved in a lot of public service back then, but the Red Cross asked if I could use my ham radio to do a damage survey. So I got involved in what was then called "civil defense". We got in the car, drove around, and relayed damage reports over ham radio to the local EOC. It was the next year that NHC contacted me. You were perfect for the job! I was a student at the University of Miami across the street from where the hurricane center was located at the time. Dr. Neal Frank said I was the ideal candidate — I live next door at the UM dorms and I have a ham radio station. I was the president of the UM Ham Radio Club. So I would borrow the radio from the UM club station, put it in a cardboard box, walk across the street and set it up at one of the Hurricane Specialist's desk. Most ham radio operators understand how to use what they call "go kits". They put portable radios together with batteries and wire antennas to use during an emergency. The technology between 1980 and 2013 has to be like night and day. The core aspect of ham radio is the same that's it's been for the past 100 years. We bounce high-frequency radio waves off of the ionosphere back down to the earth, like a shining a flashlight into a mirror. But now, some of our radios are integrated with, and connected to, the Internet. We can go from a radio in a car to a repeater that has higher power and a big antenna, and then the audio goes through the Internet and comes back over the radio on the other end so that we can get the report over a computer or another radio. When does the ham radio team spin up operations? Whenever there is hurricane threatening landfall within 300 miles of land. What's the most unusual situation you've had at NHC as a ham? I would say Hurricane Georges in 1998. It had come off of the coast of Haiti at night, gong over the pass to the east of Cuba. At that time, Cuba did not allow air reconnaissance to go over the island. The satellite imagery showed that Georges' eye had clouded over, and we did not have any reliable meteorological surface data to know where the center of the hurricane was at that time. Hurricane specialist Lixion Avila came into the radio room and said he wanted a ham on the most eastern point of Cuba. That was a pretty tall order, but I got on the radio frequency they were using for the local civil defense there, announced we were from the hurricane center, and looking for someone on the easternmost point. And lo and behold, there as a ham in Punto Este on the most eastern point of Cuba! I asked him for a weather report, and you could hear the emotion in his voice. He said he was standing on a chair with two feet of water in his house, and as his signal faded, you could hear him shout into the mic on his last transmission "del sur, del sur"! — the wind was from the south. Lixion ran out of the room, now able to fix the point of the hurricane over Cuba, and it shifted the entire track north, all thanks to that ham radio report. When you not being a ham, what is your day job? I am an architect specializing in health care design. For the past 19 years, I have been one of the architects for the University of Miami's School of Medicine and for the Bascom Palmer Eye Institute. One of my specialties is ophthalmology design.